Win 'Free Beer for Life' and Other Great Prizes! Get the Magnet. Post a Selfie. WIN! Snap a selfie and show off your Castle Church Magnet on Social Media. Use the hashtag #CastleChurchSelfie for your chance at some great prizes! Follow us on Instagram, Twitter, or Facebook. 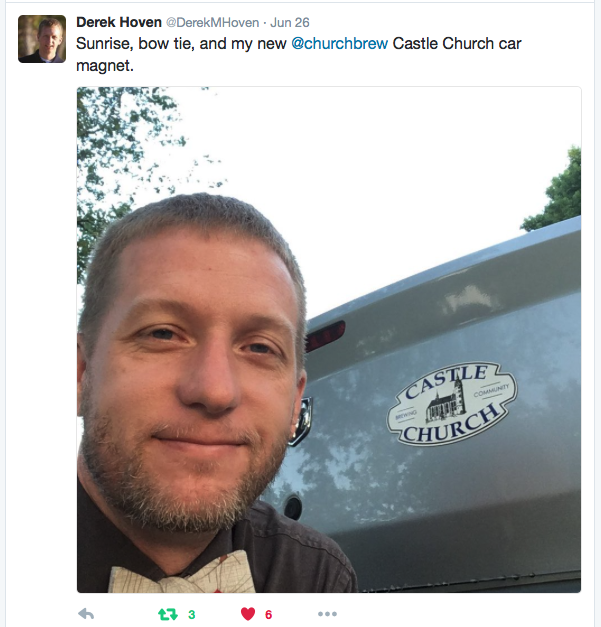 Post a selfie with the Castle Church Magnet on your vehicle. Tag your picture with the hashtag #CastleChurchSelfie. Three (3) lucky First Prize winners will be randomly selected in June and July for a First Prize from the Backer Pledge Level in our Development Campaign, and then entered into the ‘Free Beer for Life’ Grand Prize drawing, to be announced at the official grand opening! First Prize winners will be listed on our social media pages and at the bottom of this contest page of our website, so check back each month! The Grand Prize is the 'Free Beer for Life' pledge level prize from the Castle Church development campaign and provides card holders with one free 20oz mug of Castle Church beer per day for life! The promotion has now ended, but you can join in on the fun at the Castle Church crowdfunding campaign! Check it out: Take Me There! We'll pick the lucky winner at our Grand Opening Party! Congratulations Tyler! You won a Castle Church Drink Set and are entered in the Grand Prize drawing for Free Beer for Life! Congratulations Danny (a.k.a. Orlando Unicorn)! You won the official Castle Church T-Shirt and are entered in the Grand Prize drawing for Free Beer for Life! Congratulations Derek! You won a VIP invite to the Castle Church grand opening and are entered in the Grand Prize drawing for Free Beer for Life! Congratulations Ryan! You won a Castle Church Drink Set and are entered in the Grand Prize drawing for Free Beer for Life! Congratulations Joanne! You won the official Castle Church T-Shirt and are entered in the Grand Prize drawing for Free Beer for Life! Congratulations Lynda! You won a VIP invite to the Castle Church grand opening and are entered in the Grand Prize drawing for Free Beer for Life! -The Castle Church Magnet Promotion contest is open to anyone 21 year and older. -Each month, Three (3) First Prize winners will be chosen by random selection on social media. -First Prize winners will be listed below on this contest page of the Castle Church website and notified via the social media channel on which they posted. -All First Prize winners will be entered into the Grand Prize drawing, where one lucky winner will get "Free Beer for Life" (One 20oz mug of Castle Church beer per day for life, as detailed on the development page). -The Castle Chuch Magnet Promotion will run continuously until July 31st, 2016. -HAVE FUN, you're helping Castle Church with some all important fundraising!